The Teenage Mutant Ninja Turtles are coming "Out of the Shadows" (and out of nowhere) with a new trailer showing off the sequel to last year's reboot. Besides the turtles, it features fan favorite characters like Casey Jones, Baxter Stockman and, for the furries, Bebop and Rocksteady. Disappointing lack of ninja vixens; they're saving that for the next sequel, hopefully. The movie is releasing June 3 of next year, so add that to the pile. 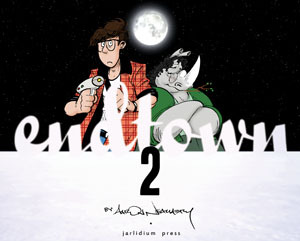 A snappy blend of Boy and His Dog sci-fi plus funny animal comics, Aaron Neathery's Endtown is one of the underseen gems in web comics. Originally debuting on the Modern Tales site - and more recently migrated to GoComics - the weekday series charts the travails of the beleaguered underground survivors of a mutant spawning radiation plague. Endtown is set six years after a cataclysmic war has destroyed almost all life on Earth, leaving only a lifeless, desertlike surface and a few subterranean towns. The survivors are divided between the airtight-suited Topsiders, ruthless 100% human purists who kill other survivors on sight because they may be mutants, and the mutants and “impure” humans who try to survive in the underground enclaves. The “mutagenic plague” transformed its human victims into horrific monsters or, what makes this strip of Furry interest, anthropomorphic animals. 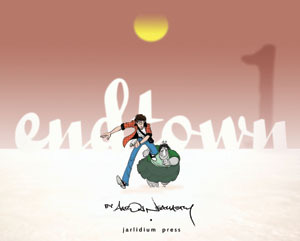 These two very handsome reprint collections present the first two Endtown story arcs. Volume 1 has the complete short ‘A Fistful of Beans’ (January 18 to March 27, 2009), and the beginning of ‘Gustine’s Quest’ (March 30, 2009 to January 14, 2011). Volume 2 completes ‘Gustine’s Quest’. Scientists have invented a new tool in an attempt to successfully artificially inseminate endangered rhinos in captivity for the first time. The quite large tool is also suitable for other large animals like giraffes, though you might need an added ladder. You think wearing a costume is hot for a few hours at a convention? Try running a 140 mile long desert marathon in one. Since they went to all this trouble, please consider helping Save the Rhino. The Javan rhinoceros, one of the world's most endangered species, is showing signs of recovery. Loggerhead turtles can detect variations in the earth's magnetic field and navigate thereby. Researchers use underwater acoustical equipment to track and count whales and dolphins.